Fast, Fun, Easy, and Free! Finding words in a word search puzzle is a fun and cheap pastime. At a bridal shower, a child's birthday party, a family reunion, or party or gathering of any kind, even Thanksgiving, it can keep your guests occupied while they are waiting for other guests to arrive, or waiting for dinner to finish cooking. A word search puzzle can be even more fun when it is personalized to the people who are finding the words. They can search for their own name in the puzzle. It can also be customized for the occasion or event. 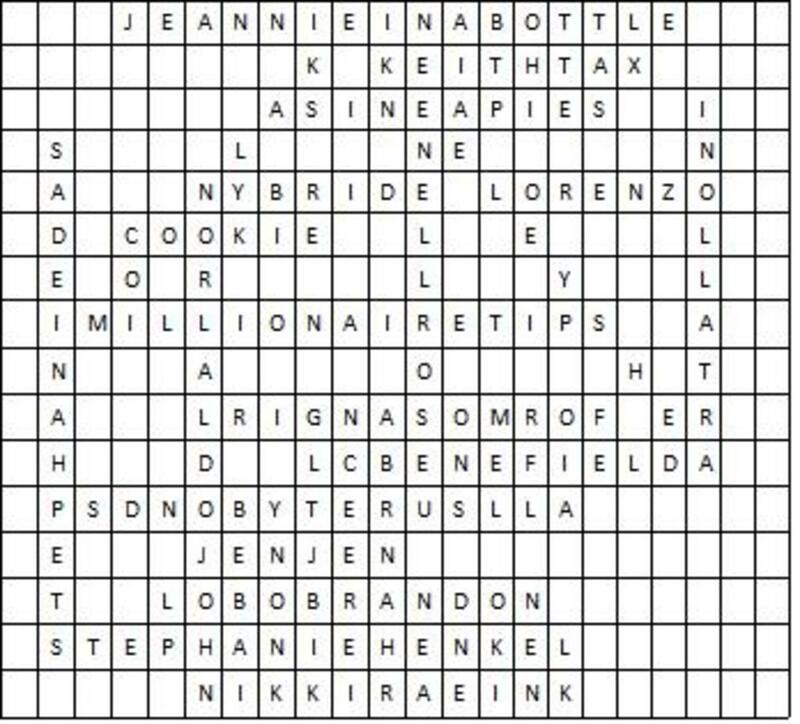 Imagine a word search puzzle for a bridal shower that is customized with the bride's interests, a word search puzzle for a family reunion that helps recall some of the family's history or an anniversary puzzle that helps recall the special bond the couple shares. A word search puzzle can be a part of a genealogy book to help youngsters get familiar with their ancestors while being entertained. 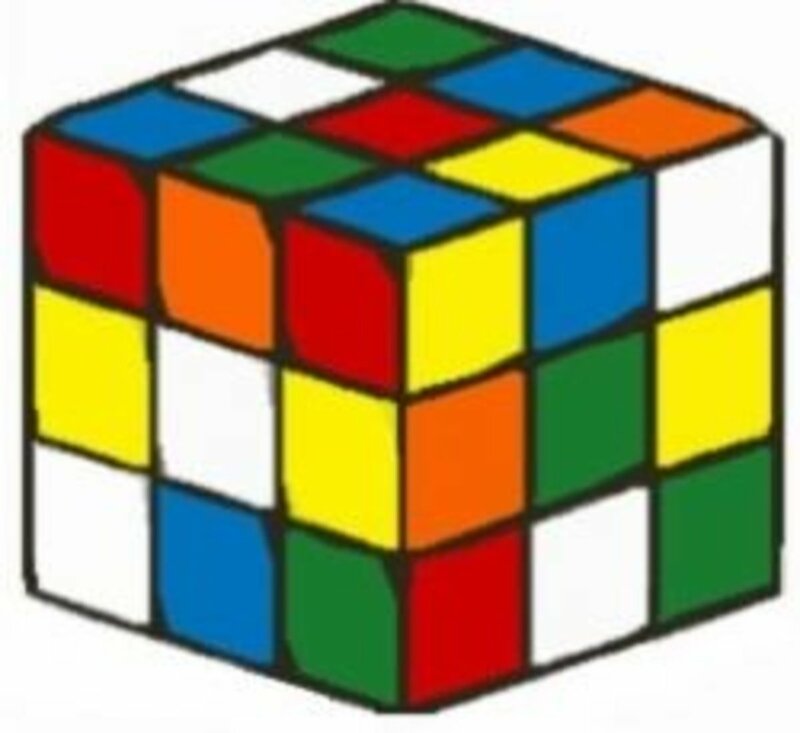 This type of puzzle goes by many names. 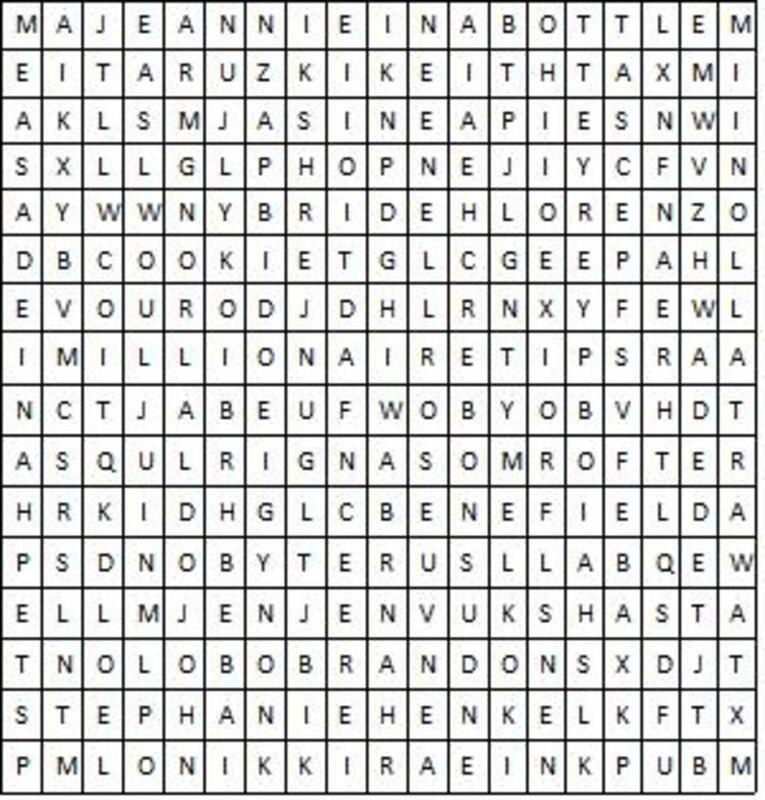 Word search, word find, word seek, mystery word, word sleuth, word search, seek and find puzzle, search and find puzzle, and find a word are just some of the many names it uses. Word search puzzles are also fun and easy to make, so the puzzle creator can also be entertained. The steps to create a word search puzzle are really easy. 1. 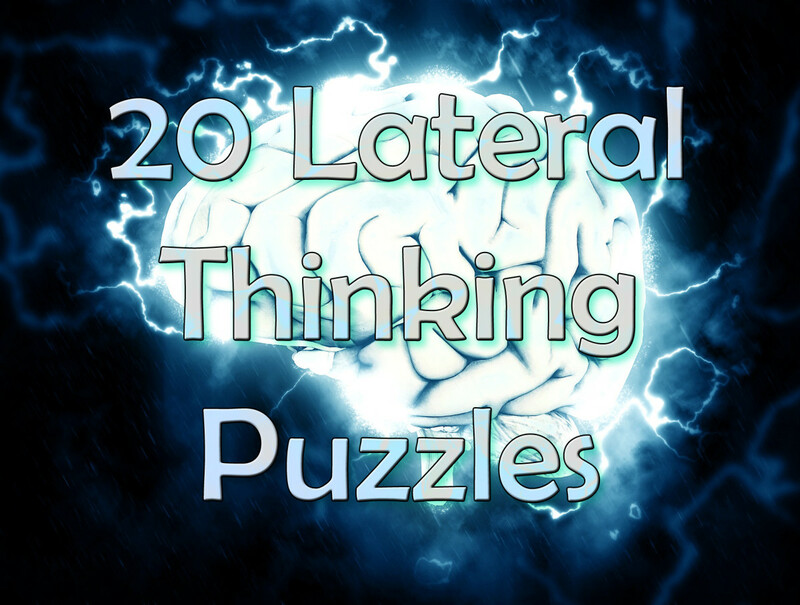 Think of the words to put in your puzzle. 3. Put the words in the grid. 4. Clean up the puzzle by putting in filler letters for the remaining spaces. 6. Seek and find the words! These steps will be further explained in this article. When doing anything on the computer, I save the file from time to time, and especially before doing anything scary, like deleting a row. That way, if I make a mistake, the file is still safe. The first step to creating a word search puzzle is to think of the words you want to include in the puzzle. Centering on a particular theme, such as family names, occupations, or hobbies, keeps it simple. Come up with a list. The more words you use, the bigger the puzzle will be. Words that are too short can cause problems because they might show up in more than one place accidentally in the puzzle, so I would avoid having a puzzle of all two-letter words. But one or two short words will be fine. You can take into consideration the age of the people who will complete the puzzle. Younger puzzlers might want a smaller list of words. You might think about how much time you want to keep them occupied. The more words you have the longer it will take to find all the words, and quite likely, the bigger the grid you will be making. I think twenty to thirty words or so would be a good size. You might even have some lower priority words - ones you will add if you have space, but are willing to omit if there isn't enough space. For this example, I am using page one of my list of followers on HubPages. I am omitting the numbers to keep the puzzle simple. Hopefully, you will recognize some of the names here. The next step is to create a grid in which you will put the words. You can do this on a piece of paper. Just draw the column lines with a ruler, spacing them equally. Graph paper would work especially well with this. I like the grid to remain flexible, so I place the grid in the center of a piece of paper so that I can add another row or column if I have a word for which I can't find a space. Draw a good number of rows and columns. My original grid started out at 20 columns and 16 rows. 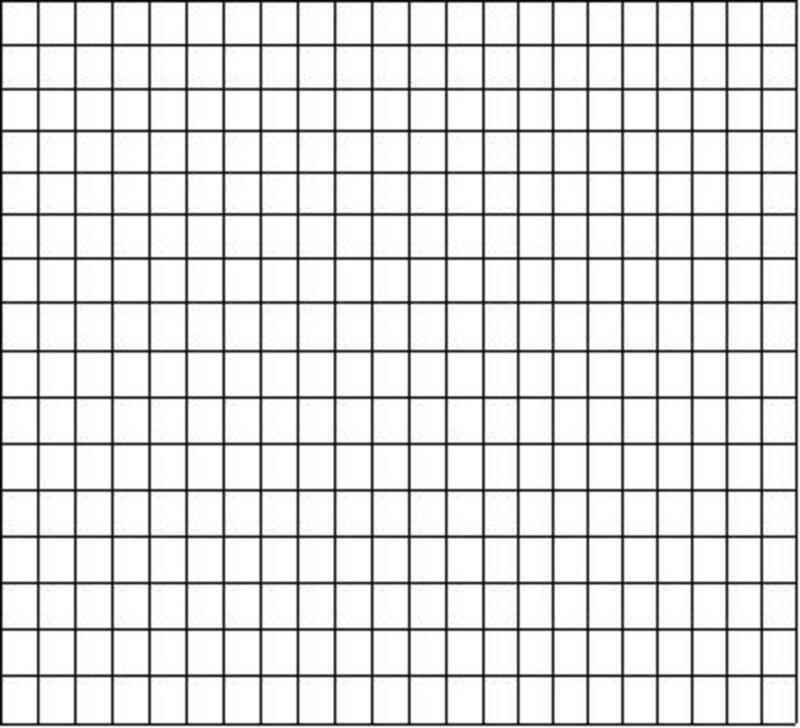 You can find graph paper on the internet, or use the picture on this article. You can also create your seek and find on the computer using a word processing software or a spreadsheet software. 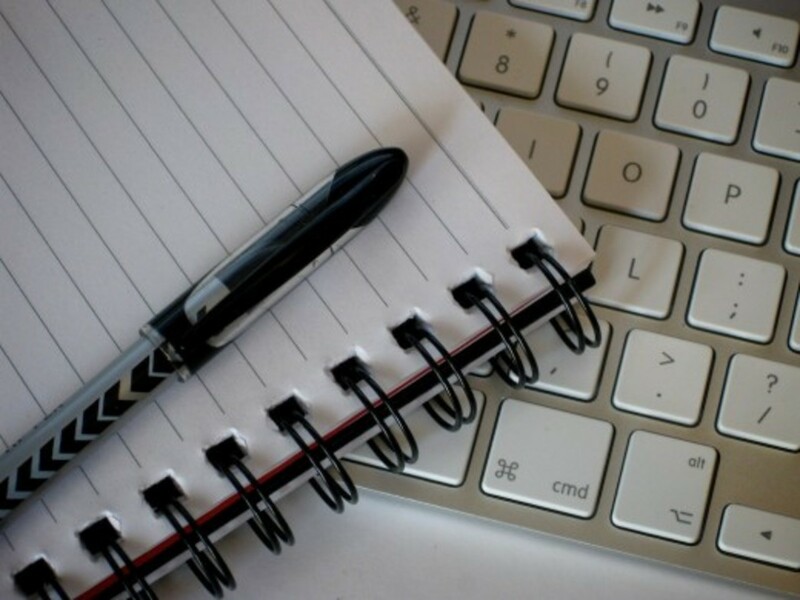 I am using an older version of Word, so I will explain the steps without going into detail. I chose Insert Table to get a table there. Then, highlight the whole table or a column on the grid, and right click. Choose Insert, then rows below, and your table will double in number of rows. Then highlight a row on the grid or the whole table, and right click again. Choose insert, then columns to the right. These steps will double the number of columns you have. I also fixed the column width so it would be roughly equal to the size of the rows, and changed the cell alignment to center the letters. The next step in creating a seek and find puzzle is to put the words on the grid. You can put your first word anywhere on the grid. Make sure you have enough space for the word where you want to place it. The letters follow each other in a straight line, either vertically, horizontally or diagonally. A phrase with more than one word must be combined into one word without spaces in between. Unless you are making a puzzle for very young children, you can even put them in backward. Try to conserve space by using a letter from one word when working on another word and by putting the words as close together as you can. 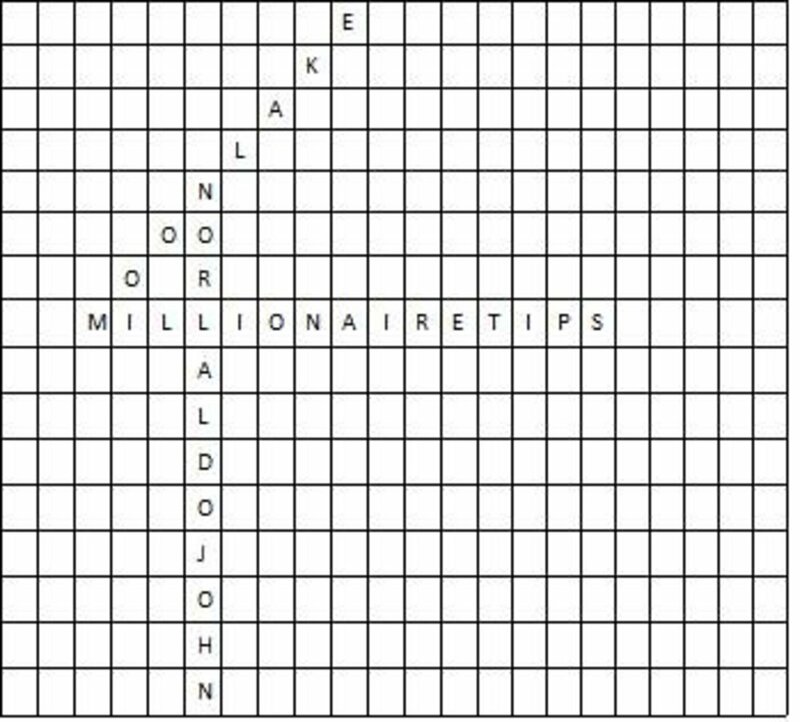 In the sample shown above you can see MILLIONAIRETIPS placed as one word horizontally in the center of the grid. The word ORLANDOJOHN is placed vertically and shares the letter L with MILLIONAIRETIPS. The word MOONLAKE is placed diagonally and shares the letter M with MILLIONAIRETIPS. 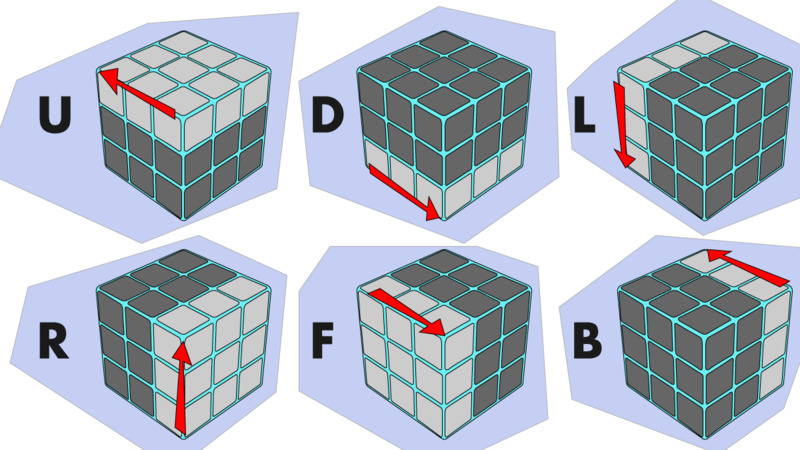 Further words can use any letters that are on the grid. Be careful to check that you have enough blank spaces to enter the whole word. It is generally easier to add the longer words first, and then try to fit in the shorter words. Once all the words have been entered onto the puzzle, you may have extra words for which you cannot find space, or extra space for which you do not have words. It is all right, we can clean it up. If you have words remaining, you can add a row or a column to include your word. Or you can skip the word, whichever is your preference. If you have columns or rows that did not get used, like I did, you can add additional words, or delete each blank row or column. I will delete the blank column on the left, and the two blank columns on the right. Right click on a cell in the column, and choose delete cells. Then choose delete the entire column option. If you are doing this on paper, you could space out your words so they took more of the grid, or you can fill the spaces as described below. Fill in the remaining spaces in the grid with random letters. If you have short words in your puzzle, you want to be careful to not accidentally repeat them here. Otherwise, I like to use common letters or starts of words, so that the people solving the puzzle think they are on the right trail of finding a word when they are not. Or you can just place all the letters of the alphabet in random places on the puzzle. 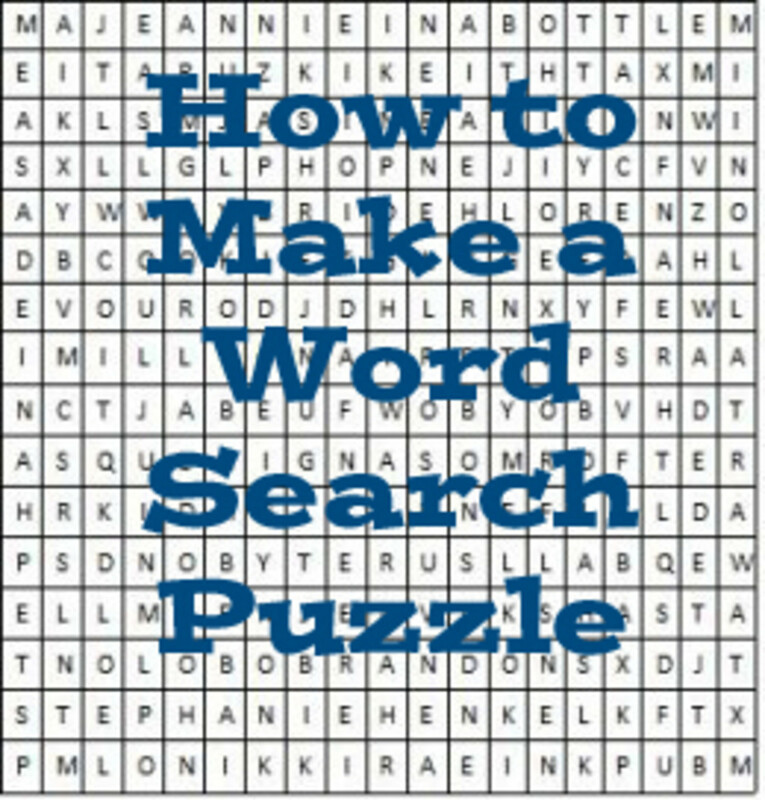 I recommend creating your own word search puzzle, because you can choose the exact layout for each word. But if you are in a hurry, you can find free online puzzle creators, such as Discovery Education, which will do it for you for free. Most of them will add some sort of advertising on your puzzle. Have You Ever Created Your Own Word Search Puzzle? That's it. It really is that easy to make your own word search puzzle. Be sure to place the list of clues on the puzzle so your puzzlers know what words they are searching for. Make lots of copies, and distribute. You can even time your contestants and give out prizes to the person who solves it first. For further entertainment, you can even teach your guests to make their own word search puzzles. Making word search puzzles is fun, and can be a great way to personalize a puzzle for a wedding, or a family reunion. It makes a great gift and provides a great source of entertainment. Comments: "Create Your Own Word Search Puzzle"
That's true SV1, there are apps that you can use to create your own word search puzzle. Making your own app would be fun though. Thanks peachpurple. I do hope you try it. It is easy and fun! Thanks colorfulone. A word search puzzle is so much more meaningful when it uses words that have special significance in a person's life. This is a really neat idea for me to make some word search puzzles for my, Mom. She can sit and find words for hours and hours each day, either that or read. - Thank you! Thanks beingwell. 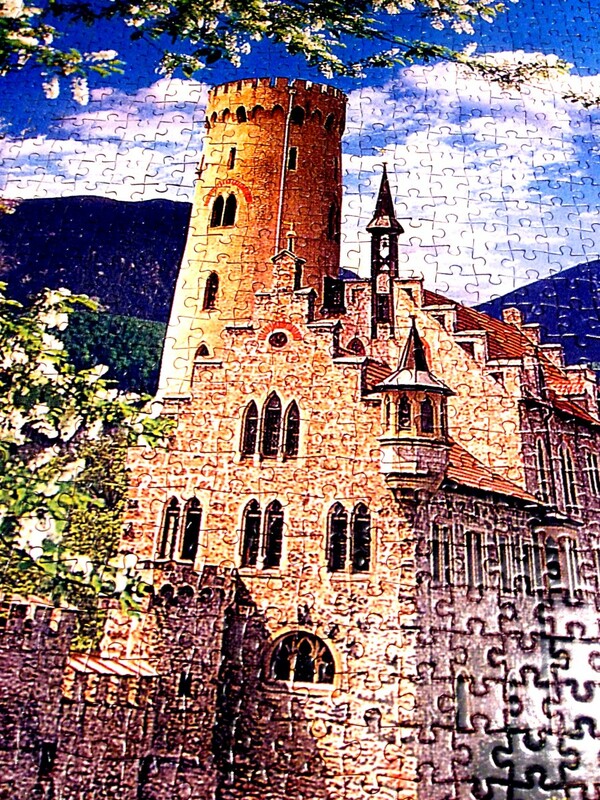 That's true, puzzles are a great way to pass time, and they keep your mind sharp while you are at it. Very interesting! Voted up, in fact! I've always enjoyed word and number puzzles. I think they're a great way to pass time! Thanks for the visit and the comment Cardisa. I hadn't thought about making money with that idea, but yes, I suppose you could. Our wordsearch books here are very inexpensive, so you would have to publish mass quantities to get any profit. Thanks for the tips Millionaire Tips...lol. This is great. The word find books are pretty popular here I could make a few buck from this idea. I've tried it before but never quite had the patience, but with your guide it should be pretty easy. That's a great idea Ardie. For young children, I would try to only do horizontal and vertical, and avoid the diagonal, backwards and upside down words. Be sure to give them a list as well so they know which words they are looking for. Thanks for your visit and comment. Thank you Tammy! I appreciate the visit and the comment and compliment. Making a wordsearch puzzle is a lot of fun. What a great and creative idea! My kids love puzzles. Well done! Thank you Trsmd. 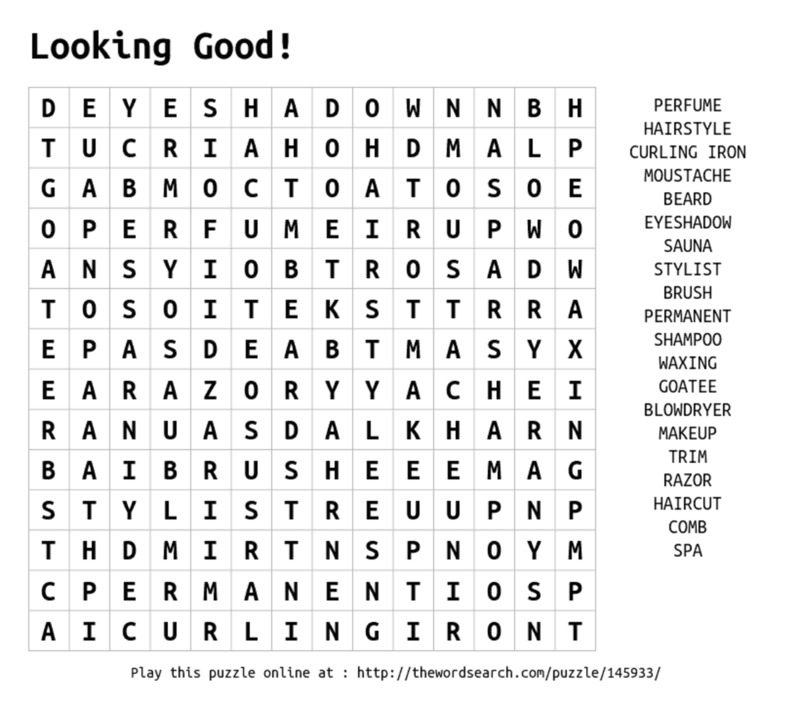 I have a lot of fun with making Word search puzzles, and enjoy solving them as well. Trust me, Giselle, it is very easy. I impressed my high school teacher by creating one. Great ideas about using them for party games. I had never been brave enough to create a word search before - but your description makes it sound very do-able. Word search puzzles are good ideas for party games (e.g. kids parties, or a baby shower game). Thanks for this helpful guide.